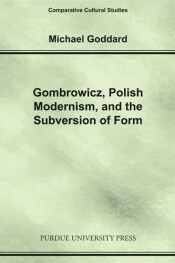 Gombrowicz, Polish Modernism, and the Subversion of Form provides a new and comprehensive account of the writing and thought of the Polish writer Witold Gombrowicz. While Gombrowicz is probably the key Polish modernist writer, with a stature in his native Poland equivalent to that of Joyce or Beckett in the English language, he remains little known in English. As well as providing a commentary on his novels, plays, and short stories, this book sets Gombrowicz’s writing in the context of contemporary cultural theory. The author performs a detailed examination of Gombrowicz’s major literary and theatrical work, showing how his conception of form is highly resonant with contemporary, postmodern theories of identity. This book is the essential companion to one of Eastern Europe’s most important literary figures whose work, banned by the Nazis and suppressed by Poland’s Communist government, has only recently become well known in the West. About the Author(s): Michael Goddard After completing his Ph.D. at the University of Sydney, Michael Goddard was employed as Visiting Professor of Cultural and Media Studies at the University of Lodz in Poland, and as Professor of Cultural Studies at Mikolai Kopernikus University, Torun. Since September 2007, he has been lecturer in media studies at the University of Salford in the United Kingdom. He is an active member of the European Network for Film and Media Studies (NECS) and participates actively in a range of international conferences and other academic and cultural events. In Mapping the Moving Image, Pasi Väliaho offers a compelling study of how the medium of film came to shape our experience and thinking of the world and ourselves. By locating the moving image in new ways of seeing and saying as manifest in the arts, science and philosophy at the turn of the twentieth century, the book redefines the cinema as one of the most important anthropological processes of modernity. Moving beyond the typical understanding of cinema based on optical and linguistic models, Mapping the Moving Image takes the notion of rhythm as its cue in conceptualizing the medium’s morphogenetic potentialities to generate affectivity, behaviour, and logics of sense. It provides a clear picture of how the forms of early film, while mobilizing bodily gestures and demanding intimate, affective engagement from the viewer, emerged in relation to bio-political investments in the body. The book also charts from a fresh perspective how the new gestural dynamics and visuality of the moving image fed into our thinking of time, memory and the unconscious. Pasi Väliaho is lecturer in film and screen studies at Goldsmiths College, University of London. A commanding and consummate study of art, philosophy, the human sciences, physics and biology in the matrix of cinema at the turn of the twentieth century. Blending contemporary theory with close readings of the foundational writings of modernity—Freud, Bergson, Nietzsche—Väliaho shows how the autonomy of the movie-machine shapes the ways we believe we think and live today. A broad and compassionate study, Mapping the Moving Image stands high and strong in an impressive body of scholarship on early cinema. It will be a point of reference for every student of cinema, consciousness and perception.